Catch 22: Why are Indian airlines not able to raise fares? The aviation industry is a slave to the price of oil, and right now, the tough times seem to be rolling in all over again. There are service cuts across the industry, and the profits have begun to go away. IndiGo’s 97% drop in profit for the first quarter and Jet Airways’ massive loss for the full year should be showing us how this is going to go from here on. The July-September Quarter is usually sluggish. For whatever reason, people don’t fly much for business. Planes are empty. However, airlines can’t just stop operating airplanes and keep them on the ground. For them, the aircraft is earning money only when it is in the air. Also, if they don’t operate flights at the slots allocated to them for a specified period, they stand to lose that slot. So, they fly those planes anyway. For the first time in many years, I saw Jet Airways trying out a new model where they are curtailing capacity on weekday routes and flying to different cities on the weekends on the same slots. I guess what I am trying to say is that while demand may be seasonal, the airline business is permanent. So, it isn’t like you can hire a contract crew to staff your planes and get them in the air when the need is high. Airlines need to do what they need to do every day of the year, regardless of demand. Moreover, they do, and each flight costs money. While there are the bills to be paid for crew and the planes, one important variable is the cost of the fuel. Like we know, this is the elephant in the room that can change the economics for everyone. So…here it is. 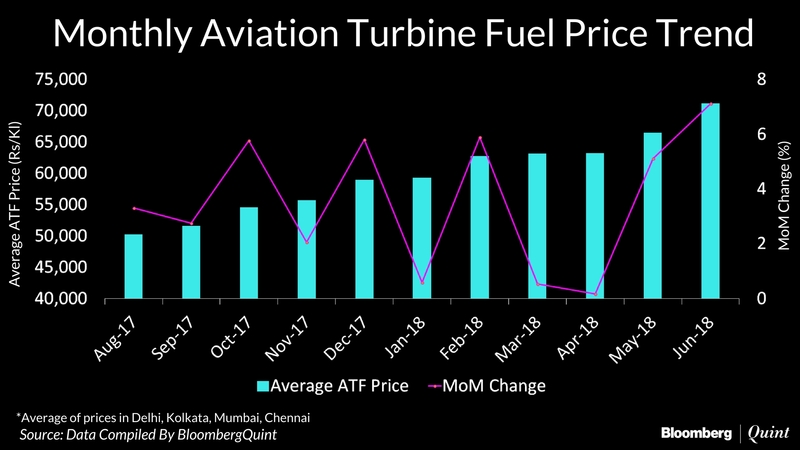 I sourced this image of fuel costs from Bloomberg Quint. Like you can see, prices have been on the rise for over a year. Since this is about 40% or more of the cost base of an airline, this begins to hurt. This is where the profits go away, and the cost base increases. This is especially bad in India because on top of the cost of the fuel; there are gazillion taxes. Moreover, for whatever reason, this is not a part of GST, which means these taxes can’t be netted off by the airlines. However, tickets are still cheap! With no ability to raise fares, airlines continue to sell under INR 3000 next-day fares on Mumbai – Delhi, for instance, and if one airline continues to price cheap, it means everyone needs to price cheap. Back in the day, a few years ago, there was pricing discipline. Which means these kind of fares were available far out, but if you have to fly a few days out or next day, you won’t get these very very cheap fares. The industry works on pricing as per how many days out you book up. So fares would change if you were booking 15 days out, seven days out or 3 days out. I’ve bought Mumbai Bangalore tickets at crazy INR 11,000 one way. For instance, here is a ticket from the past when I’ve done that. Now, here is a look for early next week. You can fly from INR 2,800 onwards on the same sector, the same number of days out. Ultimately, India is a value-conscious market to a considerable extent. So, the leisure flyer looks at airlines as an affordable luxury rather than “time is money” concept. When one airline raises fares, they can quickly expect to have their customers walk over to another carrier. So, everyone price matches everyone else, except when they can be sure of captive demand. So, if there is one carrier on a certain route, they can set prices where they at least break even. Take Delhi – Gorakhpur to be one such segment where Jet Airways, Air India, SpiceJet all operated smaller aircraft from time to time. Now, it has grown big enough for SpiceJet to send in a 737. Back in the day, I’ve paid over INR 7000 per head for one-way one person ticket on the route. Now, with IndiGo coming in, there will be two jet aircraft flying from this station, so tickets have gone down to INR 3000 one-way. On the other hand, on metro routes, a consultant will fly a full-service carrier, Mumbai – Bangalore whatever the cost, given he will get reimbursed from the client. However, if you were an entrepreneur or a leisure flyer and your favorite airline is priced at INR 10,000 for the route, but another airline is pricing at INR 3,000 within 30 minutes of your original intended flight, I don’t see how you won’t want not to take that flight instead. Even if it is poor leg room and you are in the middle seat. I would. I have indeed. Now let’s take the other scenario where all the airlines sit down and say there is a problem and they should all raise fares. This is cartelization in the eyes of the Government of India and its’ various regulatory bodies, and hence, would never fly. Already, when airlines raise prices or revenue management algorithms to start to sell the last few seats at a high cost, questions are raised in the Parliament about why did this happen? Oh, and even if they could manage to do that, you’d see a simple phenomenon. I don’t have data on this but perhaps the airlines do. They will see people heading back to trains when airline prices become unaffordable for their pocket. Someday, airlines will be able to raise prices. Till that day, they have to go through the cycles of profit and loss to establish themselves in the Indian markets. And look for the elixir of pricing power. I am curious to hear your views on this too…Would you willingly pay more for flying? I think the airline business is essentially difficult business to break even. However Airlines not making money is very dangerous situation to the economy. Jet Airways has rightly decided to hive off the royalty program. Next should be ground operations. That may be value unlocking for investors. Also budget airlines need to be mandated to provide 1 handbag & 15 kgs of checkin for all passengers so the first time flyer does not fall prey to their antics. Most carriers today operating on short haul legs depend on ancillary revenues and value bundles to make profits. Gone are the days when ticket revenues alone guaranteed profits. Unfortunately, Indian carriers are way behind the curve when it becomes to innovating on their product merchandising platforms that would increase non-ticketing revenues. Most of the charges they try to squeeze seem almost punititive versus upselling and the front line staff in the ground and air see it that ways too. It requires a mindset shift. Take for instance an airline like Virgin Atlantic that has three different economy class products including deluxe option with extra legroom seats and priority check-in. Air NZ on short haul flights offers a lite, classic and works option that comes with an empty seat next to you, meals, priority check in and extra baggage allowance. Ultimately, if consumers are opting not to upgrade the core service, it’s simply because they don’t see value in the upselling options and the airlines themselves need to go back to the drawing board. For instance on lcc carriers people would rather eat at the airport rather then munch on the room temperature samosas and stale samosas served on Indigo. How about some partnerships with popular food brands? Indian carriers have been content with suffering losses during times of over capacity and wait for competitors to either roll back capacity or exit all together versus seeing how they can disrupt the market and adapt their business models. Wanted to ask how you track airline avg fares (that picture you put up) – would be interesting to see that. I wonder for how long “the leading legacy carrier” can stay solvent though, given their leveraged balance sheet and no respite on the realisation front – along with the least fuel efficient aircrafts out of the top 3. An interesting piece of information I came across is that this airline had borrowed at 20%+ rates in 2015 and had the option to recall this loan this year – it is fairly telling that they have not done so and repriced this lower. Ajay – you have summarised the revenue side issues very well along with the cost of ATF, however these airlines have poor cost control on other parameters, i.e. maintenance contracts – they have all done this in dollars while they could have negotiated to do in INR, they have not hedged foreign exchange rates or ATF, employee costs and productivity are not in line, procurement functions in these airlines have not managed vendors, they have just changed specs to make things less expensive rather than hammering vendors to deliver better and cheaper, airport charges have not been negotiated as a group etc. I am sure it is easier said than done but they have been basking in low crude prices over the years and milked profits for the promotors. Both Jet Airways and Indigo have huge promoter shareholding (51% in Jet and 75% in Indigo) and this has led to less pressure on them from other large shareholders(like Financial institutions or Private equity players – both have negligible holdings) to perform on costs and return shareholder value. Their valuations are down 50% since Jan/Feb and I think they will have a long long time before they pick up again.